1. Absolutely crucial: always wear a helmet. Of the nation's cycling deaths, head injuries account for about 60%. If all cyclists wore helmets, perhaps half of these deaths and injuries—especially in children—could be avoided. Choose a bright colour, and make sure the helmet fits properly. It should sit horizontally on your head and shouldn't move about. 2.Brake right. To exert optimal pressure, brake with your hands at the ends of the levers. For a quick stop, as you press the brakes firmly, slide your buttocks to the very back of the saddle. This will keep the rear of the bike down so that you don't flip over the handlebars. 3. On a long downhill, don't stay on your brakes. That may overheat the tire's rim and could cause a blowout. It's safest to "feather brake"—that is, tap the brakes, applying intermittent pressure. This is wise in wet weather, too. 6. 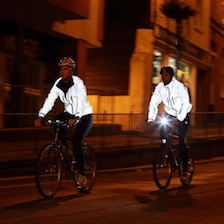 When cycling at night or when visibility is poor, wear brightly coloured, reflective clothing, and use your headlight. 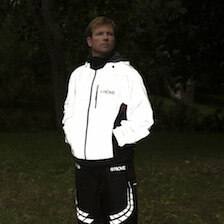 In fact, wearing bright colours is a good idea at any hour. 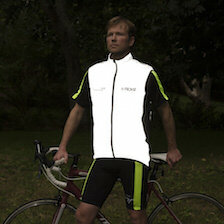 Also consider a rear strobe-type light (attached to the bike or your belt) to enhance visibility at night. 9. Position the handlebars correctly—one inch lower than the top of the seat. Drop handlebars (preferable because they allow you to change your riding position) should be about as wide as your shoulders or slightly narrower. Some cyclists who suffer from neck or back discomfort may prefer upright handlebars. 10. To avoid saddle soreness, get the right seat. The hard narrow seats on racing bikes can be particularly uncomfortable for women, who tend to have widely spaced "sit bones." Special anatomically designed saddles—wider and more cushioned at the back—are easy to install. 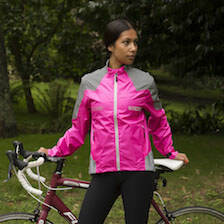 Gel-filled saddles or pads or sheepskin pads can ease the pressure and friction. 13. Unless you're an experienced cyclist, don't use those special aerodynamic handlebars—shaped like an upside-down "V"—which let you lean forward on your forearms and thus reduce wind drag and increase your speed. These increase the risk of injury. 14. After a long uphill, don't coast downhill without pedalling. As you climb up the hill, lactic acid builds up in your muscles and can contribute to muscle soreness. By pedalling lightly but constantly while coasting downhill (even if there's little resistance) you can help remove the lactic acid. 17. Don't wear headphones. They can block out the street sounds you need to hear in order to ride defensively. Cycling with headphones is a misdemeanour in some areas.